Have your dog or puppy come play with us! 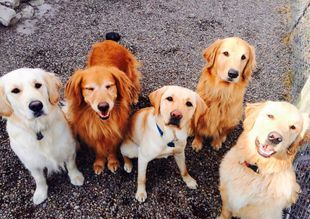 Dog daycare relieves boredom and stress and provides an outlet for excess energy. You know what they say... A tired dog is a good dog. It's true! Let us tire your pooch out while you're at work. Our building is climate controlled, kept cool in summer and warm in winter. We have separate areas for small and large dogs. All dogs are supervised by our experienced trainers, not just staff. We have matting designed specifically for dog daycare, providing cushion and support for joints during play. All play and potty areas as well as toys are sanitized daily. 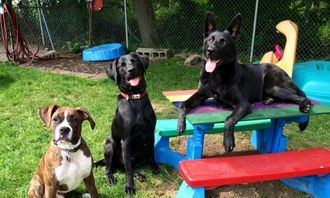 Our Daycare is staffed by dog trainers who are all members of the International Association of Canine professionals. 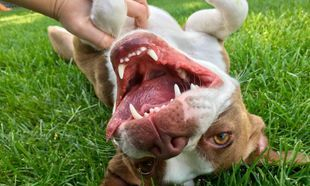 Our staff is very experienced in dog body language and play. Let your dog play with us and enjoy peace of mind that they are in good hands! Take pride in knowing your pets are safe while they play, as our staff are all certified in pet first aid through Pet Tech! All Dogs attending daycare MUST be current on Rabies, Distemper, Parvo and Bordetella vaccinations. Dogs must be spayed by six months of age or neutered by seven to eight months of age. 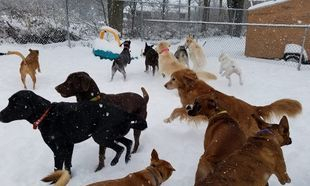 With discounts offered for multiple days/dogs we keep Daycare fun and affordable! We don't charge extra for medication administration or meal feeding. We take the hassle and worry out of your busy, changing schedule! 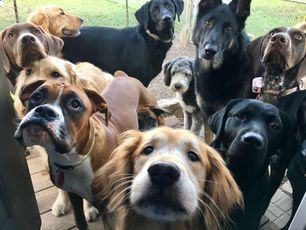 Once your dog is a member of our daycare family, there is no need to schedule daycare in advance! Simply bring your dog when you feel like bringing them! There is no need to make a prior arrangement after your dogs first day. Excellent! We think so too! Who doesn't enjoy running around with their friends? All dogs, unless enrolled in classes or that have undergone an evaluation previously must schedule a daycare eval. Daycare evaluations are by appointment only. Give our office a call to get your dog signed up! 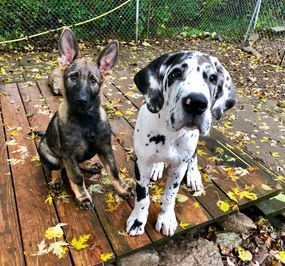 Check out our Daycare and Train program! 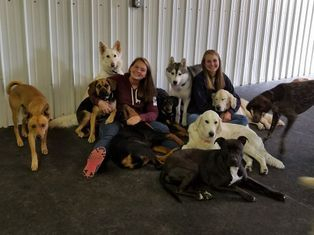 Interested in having your dog trained during their day at daycare? Check out our Daycare and Train Program.